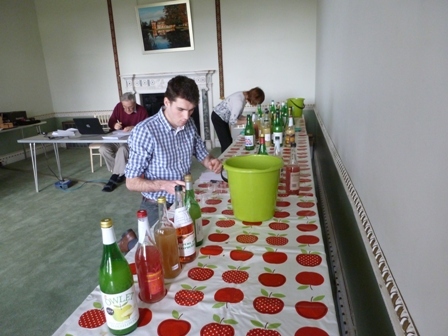 Divided into two groups; one judging the 'single variety' juices and the second judging ' blended' juices (all blends contain apple juice, but may have Blackcurrant, Raspberry or other fruits blended to create a unique tasting juice. 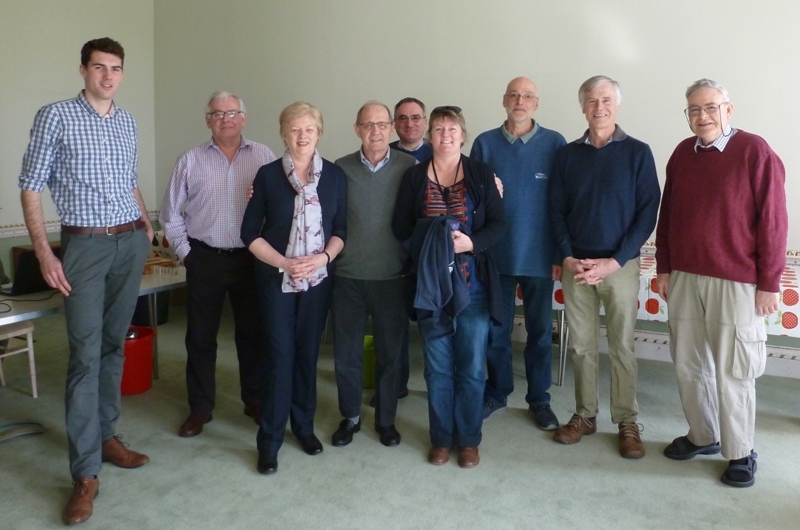 On Thursday, The English Apple Man was invited to join personnel and guests of The NFU Mutual Tenterden & Ashford Branches at the annual Taste of Kent Awards held at The Kent Event Centre at Kent County Showground. NFU Mutual sponsored the 'Kent Sparkling Wine' reception prior to the dinner and awards ceremony. 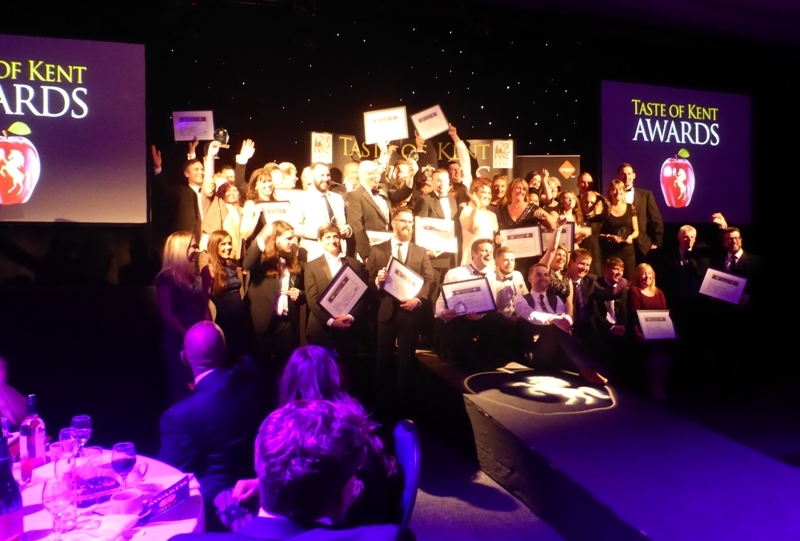 The winners of Produced in Kent's Taste of Kent Awards have been revealed yesterday (Thursday 9 March), after being recognised as Kent's ultimate food and drink champions at this year's black tie event, which was held at the Kent Event Centre, Kent Showground, Detling. Stephanie Durling of Produced in Kent, comments: "We would like to congratulate the winners and all the finalists. This year's awards have once again attracted thousands of vote from across the county and beyond and the results were once again extremely close. 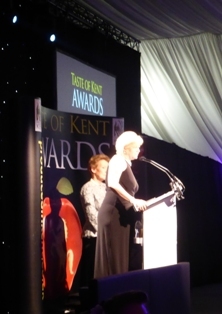 "The people of Kent have chosen the flavours, products, produce and venues they have enjoyed the most over the last 12 months. The awards not only highlight the finest produce the county has to offer but, for the winners, the awards are the ultimate stamp of approval from their customers and confirmation of their food and drink excellence." 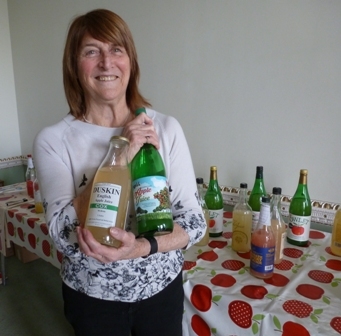 Erica Dennett, Partner at Cripps, said: "At Cripps we are stalwart supporters of the local food and drink industry and are proud to have been the main sponsor of the Taste of Kent Awards for the sixth year running. The quality of this year's finalists has been very impressive." Stephanie Durling adds: "We would like to thank everyone who nominated and took the time to vote. It's fantastic to see just how much people appreciate the produce of Kent. We would also like to thank Jason Freedman owner of Curiously Kentish for preparing an exciting Kentish dinner for us again this year and students from Mid Kent College. We would also like to extend our thanks to the Kent Event Centre and the Showground for their valuable support. 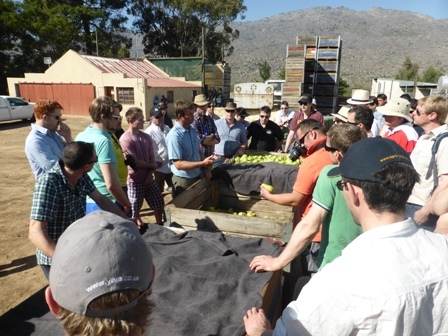 Last week, The English Apple Man reported on aspects of The 2017 Under 40's Conference held for the first time in the southern hemisphere in South Africa. In this week's Journal we will look at visits on the first 2 days of the U40 Conference Programme. 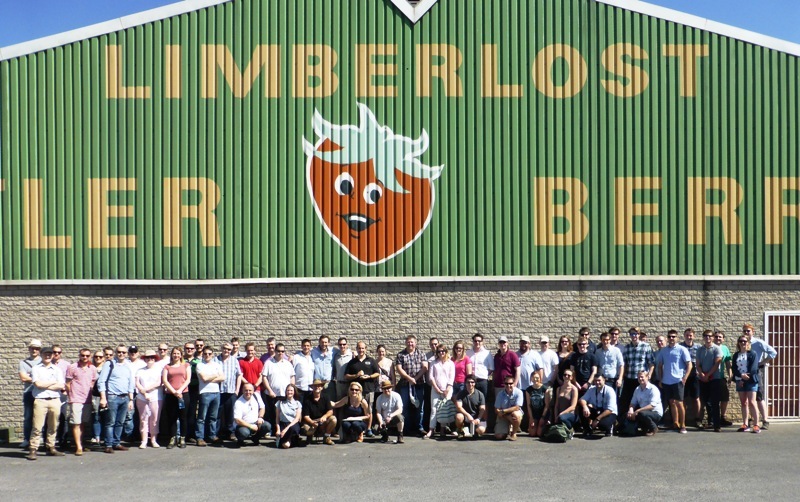 On Monday 27th February, having arrived at Capetown circa 8am that morning, we set off for Zetlers Strawberry Farm in Stellenbosch. 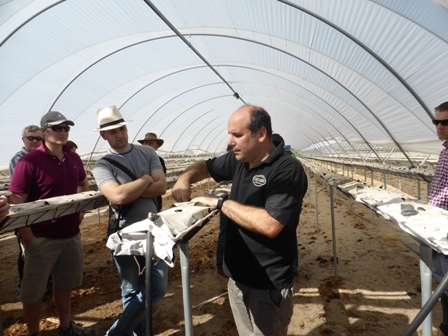 Initially we saw the bed making process for strawberries grown in soil. 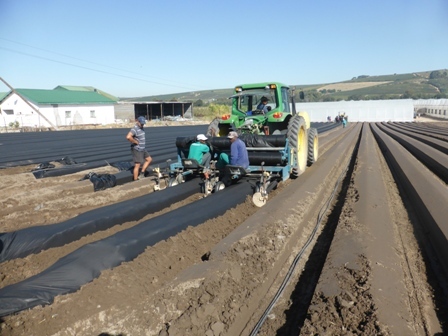 A machine forms the beds, then a second machine lays the irrigation pipes and black plastic mulch in one operation. 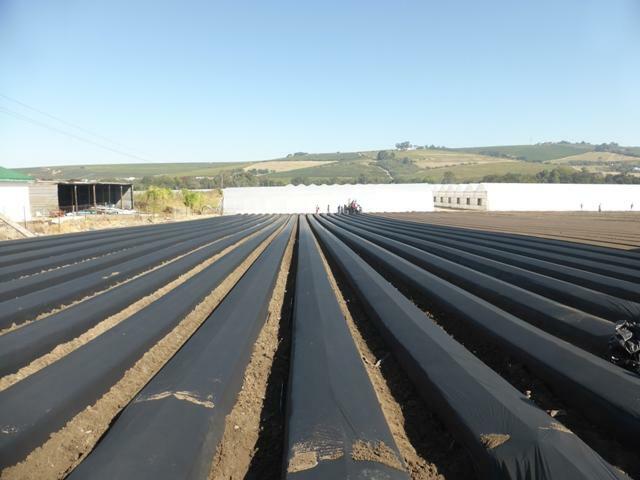 When forming the beds, fumigation is carried out 21 days before planting date via irrigation; once planted the first pick is 55-60 days after planting. Land is expensive in this region; probably the most expensive in the country. Land with water commands prices from half to one million Rand a hectare; realistically nearer 1 million Rand. £30,000 to £60,000. Pressure on prices is driven by millionaires/billionaires from outside farming buying up the land and forcing up prices; wealthy buyers seeking 'lifestyle farms' rather than commercially productive farms. This adds pressure on the grower to maximise production on the existing land. Tunnels are set up to maximise plants/rows. Increasing plant density from 56,000 plants per hectare in the soil planted in 6 rows in a 7.5 metre tunnel. In the hydroponic bag system, plant density is 85,000 per hectare. Water availability and quality is critical; at the moment Leslie Zetler has sufficient water supply, but if the continuing dry weather pattern continues (yearly) that will become an issue. The water flowing in from the rivers carries many pathogens. One in particular; 'phytophthora' requires extensive filtration to remove the pathogen. Once infiltrated into the growing soil the pathogen will spread like 'wildfire' to neighbouring soil/plants. Phytophthora fragariae (Red Core) is the devastating pathogen. Responding to a question: Leslie Zetler said varieties from Florida and California worked well, and Sabrosa (a premium fruit) commands a 10% better price but has a slightly lower yield. Leslie Zetler said he targets later production and hence we saw preparation rather than plants and fruit. 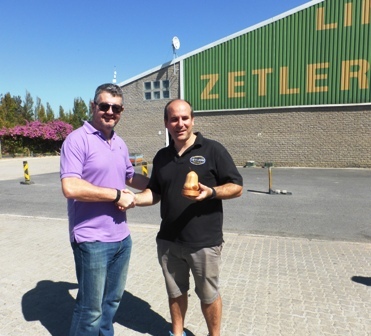 With a strong market in South Africa, Leslie extolled the virtues of Woolworths and their distribution system; 60% of Zetlers Strawberries are sold in Johannesburg. Tuesday 28th February and we are up bright and early; leaving the hotel at 6.30am for Ceres. Ceres is the main town in the region and located near to Worcester. This region of the Western Cape is known as one of the richest agricultural centers in South Africa. A high density of orchards and farm land surround the town of Ceres. The region grows a plethora of apricots, apples, peaches, cherries and pears. 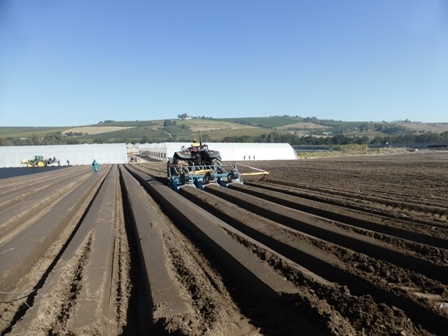 -	Agriculture is one of the pillars of the Western Cape economy. The province's diverse agricultural conditions enable a unique crop mix and productivity, while the stable and relatively adequate winter rainfall ensures production stability. -	The Western Cape has 13 million hectares of agricultural land and in 2007 contributed 20.8 percent of gross farm income and provided 24 percent of farm jobs in South Africa. 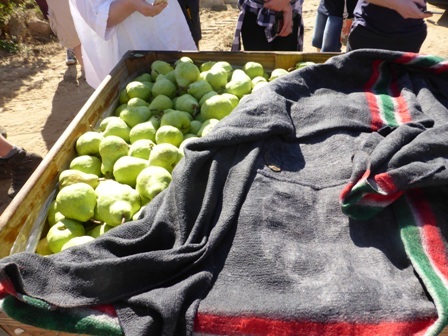 The food value chain, which includes agriculture and processed agricultural products (food, beverages and tobacco), contributes about 36 percent of the Western Cape export earnings. -	More than 75 percent of the total agricultural output comes from fruit, poultry/eggs, winter grains, viticulture and vegetables. 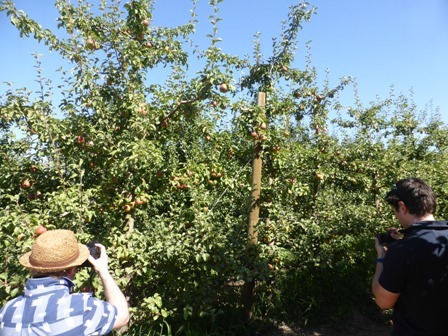 The first visit of the day was to Mark Boerlage who farms 70 hectares of Apples & Pears. 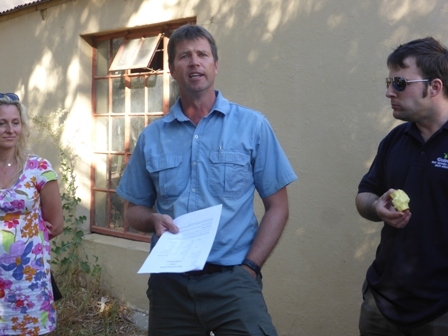 High on the list for discussion; controlling pests in the (often) extreme heat; Mark illustrated the temperature profile, with his daily records for January; 35-40C / 38-44C / 28-44C .......February; 35-43C / 28-28C / 36-42C / 29-38C. The temperature results in the Red Spider Mite having a 3 day life cycle, so trying to control it is challenging to say the least. By comparison, in the UK we are able with careful use of predators; e.g. phytoseiids, to control Red Spider Mites with very little, or no insecticide sprays. 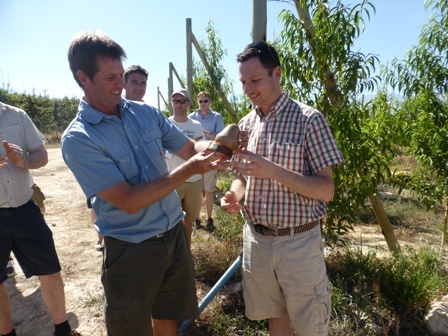 Mealy bug is another problem for Mark and 'mediterranean' fruit fly which is combatted with a baiting programme and by spreading 'sterile' males by helicopter. The latter (helicopter) part of the strategy used by the local government to contain fruit fly. 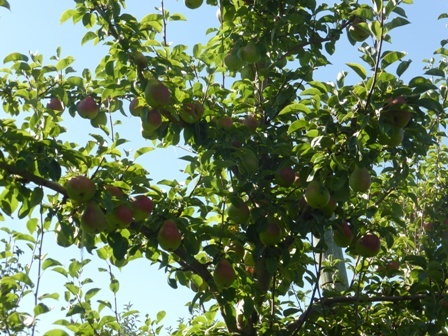 Packham Pears yield between 60 tonnes (on older trees) up to 90 tonnes on younger (established trees) planting distance is 4.5 metres x 1.5 to 2 metres in the row. Forelle Pears are planted at 4 metre between the rows. Mark also grows Granny Smith (with some planted in 1973) Royal Beaut and Golden Delicious. 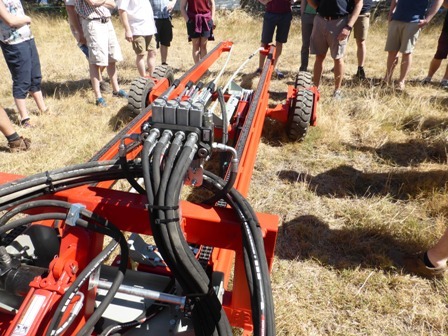 Hosted by James Reid our visit to Red Ant Machinery proved to be very enlightening. Three particular pieces of machinery were on display. 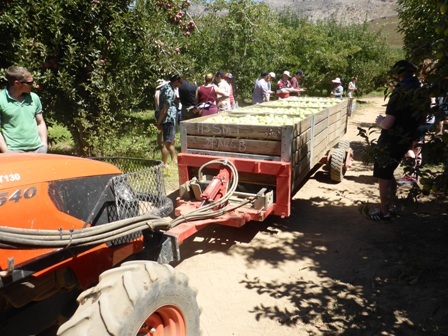 A trailer with powered chains allowing loading by the tractor operator; the trailer is front mounted on the tractor and 'strange though it looks' works very effectively in the orchard. 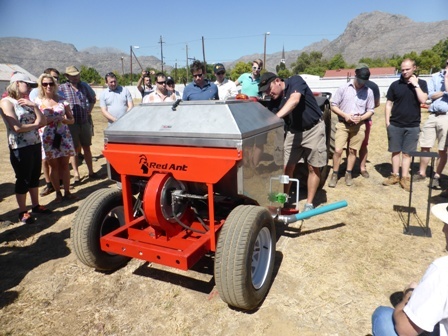 A novel fertilizer spreader which delivers granules from tubes on either side of the unit accurately onto the weed free strip beneath the trees. 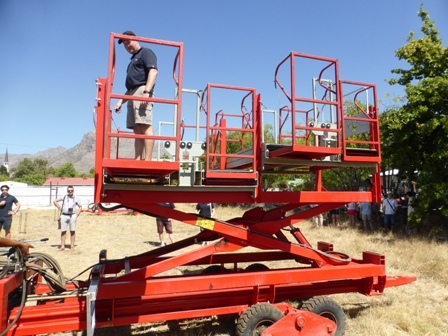 Prices for the machinery we saw are: Powered trailer circa 120,000 Rand (£8,000) - Fertilizer Spreader circa 75,000 Rand (£5,000) - Platform (complete with trailer) 260,000 Rand (£17,333) based on 15 Rand to the £. 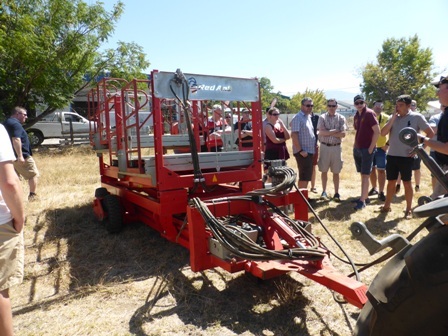 Click on Facebook for video of Facebook Red Ant Agri equipment at work.